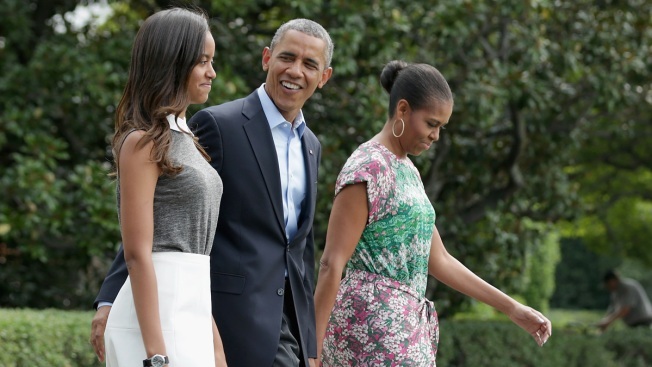 From left, U.S. President Barack Obama, first lady Michelle Obama, and their oldest daughter Malia Obama walk out of the White House before boarding Marine One August 9, 2014 in Washington, D.C.
Malia Obama could be heading to New York City for college. The 17-year-old first kid is, like many fellow high school seniors, completing college applications and nervously taking standardized tests as she prepares to go to college, her mother said over the weekend. And among her top choices are two New York City institutions: Barnard College and New York University. Also on the list are Wesleyan University and Yale in Connecticut, along with Tufts, Brown, the University of Pennsylvania, Stanford and the University of California at Berkeley. Earlier this year, Michelle Obama said that the first family had been talking about Malia's choice "every night." "We are talking about this in my household every night, every night. And there's really no magic formula," the first lady said. "It is a very individual decision." Michelle Obama has said that her daughter wants to be a filmmaker, and NYU has the respected Tisch School of the Arts, which counts directors Martin Scorsese and Spike Lee among its alumni. Malia spent last summer in New York City interning on the set of HBO's "Girls," the raunchy comedy-drama starring Lena Dunham. She decamped to California in the summer of 2014 to work as a production assistant on "Extant," a CBS sci-fi drama featuring Halle Berry. Mrs. Obama recently disclosed that Malia has also done several internships at the Smithsonian's National Zoo in Washington. Wherever Malia goes, she won't be a true legacy. President Barack Obama is a 1983 graduate of Columbia, which is affiliated with Barnard but isn't the same institution. And Michelle Obama is a 1985 graduate at Princeton. Both the president and first lady earned law degrees at Harvard.